This post is sponsored by Red Mango and BRIX Holdings. All thoughts and opinions are 100% mine. Despite the busy holiday hustle, we carved out some time to commemorate Liam’s first haircut with some special family time and Red Mango smoothies! The holidays are busier for everyone. There are parties to attend, presents to buy, year end projects to finish, guests to host, 4th quarter busyness and more! It’s easy to get swept up in all the to do list items and lose track of time with family and friends. We try really hard to carve out time for us as a family and us as a couple no matter how crazy things get, even when it means making small moments special. 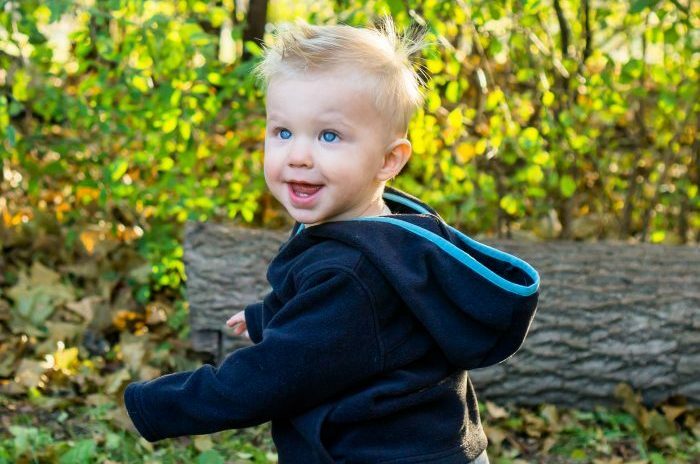 For us, it meant carving out a little bit of time during Thanksgiving preparation to get Liam his first hair cut! Bryan was coming off a week of highly intensive work training, I had 5 deadlines to meet and a meal to prepare for, but we had been talking about getting his haircut for weeks. It had gotten a little shaggy and started getting into his eyes, so it really was needed. Plus who doesn’t want to be extra spiffy for the holidays? 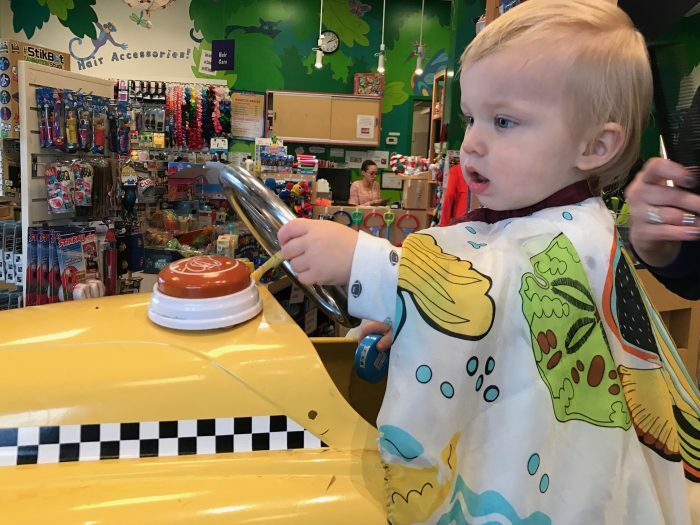 We decided to make an appointment at one of the special kid places for his first; one of those places with the little cars for him to sit in and who give us a certificate at the end with a picture and a piece of his hair. He did amazing! We were half expecting him to need to sit in one of our laps, but the lady put on a some Moana clips (his Kryptonite) and gave him a couple silly buttons to press, and he was good! Content to watch his favorite movie, stare at Mirror Liam, and make a lot of noise. After, we thought it would be nice to get a little treat and let him run around. A reward for his good behavior and a way to keep the nice family time going. So we decided to go to Red Mango to get a smoothie to share! I’ve always been a big smoothie fan, and the ones at Red Mango are thick and delicious! Plus I love the nutrition factor for me and for Liam as they are made with coconut milk and all-natural. Many of the smoothies are also gluten free. We ordered a Roasted Peanut Butter since Liam loves peanut butter, and it became an instant hit! The Roasted Peanut Butter smoothie is one of their three fall-flavored smoothies this season with the other two being Banana Chai and Pumpkin Spice. 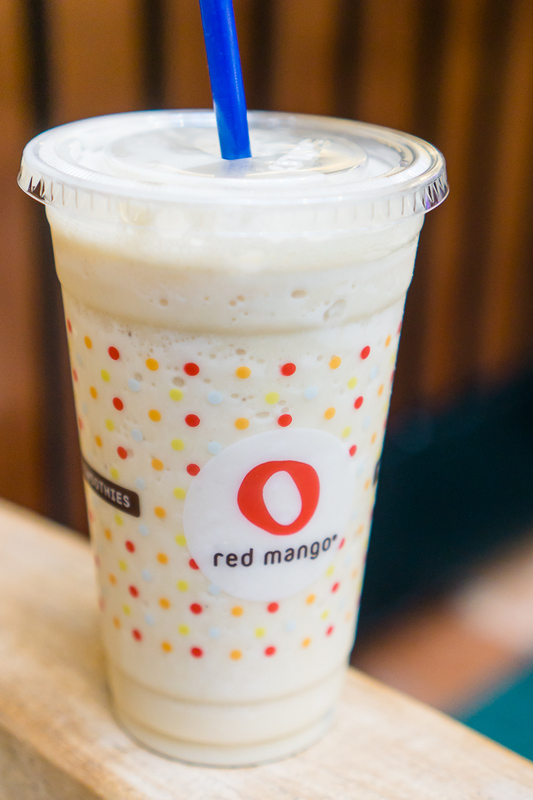 Banana and Chai is a surprising combination that I now want to recreate at home once it’s gone at Red Mango. It’s creamy and sweet with just a little hint of spice from the chai. 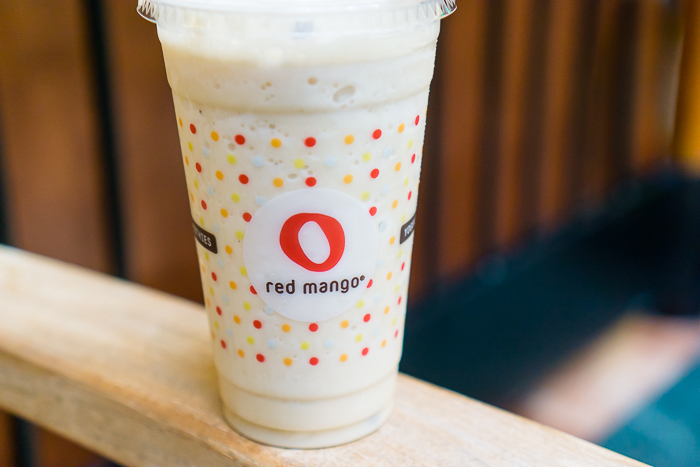 Ready to head to Red Mango and give one a try? Head over to their site and search to find a location near you. You can make one of your small moments special or at least power up for all your holiday shopping!